Minister of Science, Industry and Technology Fikri Işık: "Industrialism under Such Severe Conditions is a Heroic Act"
The ordinary assembly meeting of Istanbul Chamber of Industry (ICI) was held on December 23, 2015 under the main theme "The Key Role of Effective Economic and Industrial Cooperation for Quality Production Ahead of the New Reform Era." ICI Chairman of the Board Erdal Bahçıvan gave the opening remarks at the meeting where Minister of Science, Industry and Technology Mr. Fikri Işık was also present. 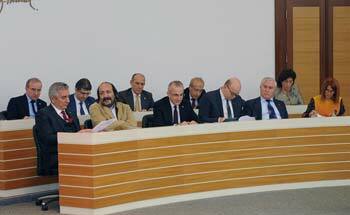 The Istanbul Chamber of Industry 2016 Budget Proposal and Justifications Report was read out and voted in the meeting. Assembly members unanimously accepted ICI's budget for 2016. ICI Chairman of the Board Erdal Bahçıvan pointed out that ICI had never been a complainer, opting instead to become a part of solutions, adding their determination to uphold this position in the future as well. 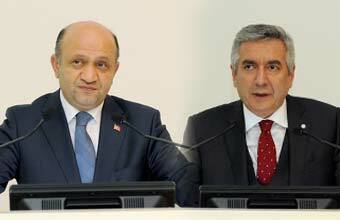 Bahçıvan also referred to the recently completed ICI report on expectations from and propositions for the 64th government which the chamber will submit shortly: "I would like to especially draw your attention to the fact that our study on the expectations from and propositions to the New Government is a clear testament to our determination." Minister of Science, Industry and Technology Mr. Fikri Işık in his turn described industrialism under such severe conditions as an act of heroism. Minister Işık's words received prolonged applause from ICI assembly members. He also emphasized their awareness of difficulties experienced by industrialists, adding that economic growth used to rely on increased efficiency in the past, an era which is drawing to a close. He called for Turkey's need to write another success story. Mr. Işık pointed out that manufacturing industry needeed to be the driving force behind growth, referring to Germany and South Korea standing upright against the 2008 crisis in contrast with the experiences of Spain and Greece. He also emphasized that Turkey must manufacture products with higher added value, drawing attention to the significance of qualified and sustainable production. Işık emphasized the importance to produce with less input and less waste which is synonymous with sustainable production. He added that rather than importing new technologies, Turkey must produce biotechnology, nanotechnology, 3D printers and internet of things in a world dominated by such technologies. "Two elections were held in Turkey in 2015 which fostered a climate of uncertainty. Terrorism has been rampant while our neighbors still suffer from conflicts. You know that Russia-Turkey relations are also troubled. But we must not be pessimistic. Turkey has always prevailed over trying conjunctures. Our country needs to make a positive distinction. We are ahead of a four-year reform period. We pay attention to this transformation program and next-generation production models led by the industry. We need to develop based on a model of our own. We can achieve far-reaching growth in cooperation with the political power and civil society. We want a new production era based on a social consensus. Our country has a geopolitical advantage. And our duty is to build a strong economy together." Zeynep Bodur Okyay later invited ICI Chairman of the Board of Directors Erdal Bahçıvan to deliver his speech. 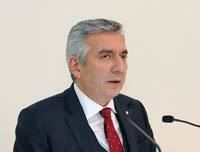 Bahçıvan stated that no one should expect a smooth running of economic transformation programs and action plans. He said "Every rose has its thorns and the forthcoming transformation process will inevitably come with its issues." He added that it wasn't going to be easy to eliminate economic troubles built up over many years and that they must establish proper and timely negotiations with chiefly Ministry of Science, Industry and Technology as well as other related ministries on the bumpy road of transformation to find solutions to potential problems. “It is reported that further chapter openings in the first quarter of 2016 might be in the pipeline including chapters on "energy", "justice and civil liberties", "justice, freedom and security", "education and culture" and "foreign security and defense policy". Notably, the opening of these chapters has so far been blocked by Greek Cypriot Administration of Southern Cyprus. If things go according to plan about the Cyprus issue with a solution worked out in March 2016, Turkey-EU relations will gather further momentum. Another outcome of the Brussels Summit was the visa exemption issue which we industrialists pay significant attention to. The Summit produced a decision on launching the "EU-Turkey Visa Exemption Dialog" and "Readmission Agreement". If put into practice, the agreement will allow Turkish citizens visa-free travel to EU countries as of October 2016. The revival of the EU negotiation process will have a positive impact on the concurrent reform process Turkey is about to enter. Just like in previous years, EU will hence create a strong anchoring effect in economic reforms in Turkey." Bahçıvan also mentioned the climate conference in Paris. He noted that the United Nations Climate Summit which hosted 195 countries produced an agreement to keep global average temperature rise below 2 degrees and limit the rise, if possible, to 1,5 degrees. Bahçıvan referred to the ineffectiveness of the Kyoto Protocol adopted in 2005 with largest carbon emitters not ratifying the protocol; adding that the agreement reached in Paris was the first universal climate agreement achieved so far, a remarkable contrast with the failed protocol. Bahçıvan later stated that the agreement was worthy of note in legal terms and paved the way for a post-carbon era with a goal to putting an end to the use of fossil fuels. In this regard, he referred to how the agreement is considered a "turning point in the history of industry". Bahçıcvan noted that the issue was not limited to greenhouse gas emissions that lead to climate change or a general battle against environmental pollution but it devises a sustainable development strategy. He added that in a nutshell, while the age of Second Industrial Revolution based on fossil fuel energy is drawing to a close, a Third Industrial Revolution based on renewable energy rises in the horizon. "Acting fast and on time is a weakness we suffer from as a society. We believe that this weakness will not be allowed to undermine the goal of transformation. We believe in this because a system is put in place that lays out what agency will undertake which reform. We also find it meaningful and valuable that a board is established to ensure coordination and monitoring of reforms. The route ahead is set: Structural Reform Programs, Turkish Industrial Strategy Document, 64th Government Program and Action Plan for 2016... All of these documents will guide our transitioning to quality production and achievement of global competitive edge. The reform era launched in Turkey gains even more import in an age when small growth rates are a global issue. We find small growth unacceptable for a country like us with major goals and a young population. Bahçıvan passed the floor to Minister of Science, Industry and Technology Mr. Fikri Işık who referred to their fundamental vision based on humans, the subject of life itself. Işık stated that everything in life served human happiness, and that the government prioritized welfare growth for our people and boosting the reputation of the country. Işık also referred to the need to achieve high growth rates to overcome the middle income trap, adding that growth used to rely on increased efficiency in the past, an era which is drawing to a close. He called for Turkey's need to write another success story. Mr. Fikri Işık also referred to the need to adopt a culture of R&D and innovation, with a lot of responsibility falling on the shoulders of universities. He also mentioned numerous incentives to draw universities closer to production. Referring to the reinforcement of R&D and innovation ecosystem as an integral part of value added production, Işık pointed out that the number of R&D centers rose to 227 while that of technology development centers rose to 63. Işık also mentioned their support for high-technology producing national companies with new legislative amendments, with 5th Region discount in high technology production all across Turkey and 6th Region discount in Organized Industrial Zones. Minister Işık described the upcoming term a four-year structural reform period, adding that they worked on four reform packages, namely R&D reform package, intellectual property rights package and restructuring of TÜBİTAK. 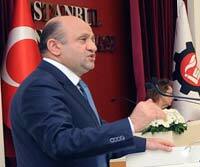 Işık expressed their desire to see SMEs as the driving force behind the transformation period. Işık also mentioned the importance of developing project capabilities in SMEs, underlining that Turkey would reach its goals only if SMEs achieved desired results. Işık called for industry's and ICI's support especially for the reform package on production, referring to ICI Chairman Bahçıvan's proposal to develop a model in which industrialists are granted land for construction of buildings. Fikri Işık stated that industrialism in this age was an act of heroism, adding that the Ministry of Science, Industry and Technology is there to serve the industry and has become more service-oriented with recent restructuring. He also mentioned efforts to simplify bureaucracy. Also present at the assembly meeting were Undersecretary of Ministry of Science, Industry and Technology Ramazan Yıldırım, Principal Clerk Ahmet Akyol, Ministry Consultant Yılmaz Şahin, Press and Public Relations Adviser Ertan Ömeroğlu, Director General of Industry İbrahim Kılıçarslan, Director of Science and Technology İlker Murat Ar, KOSGEB (Small and Medium Enterprises Development Organization) Vice President Yusuf Keskin and TSE (Turkish Standards Institution) Deputy Secretary General Aykut Kırbaş.